12th Edition eBook 856 pgs. 12th Edition eBook 725 pgs. stamps! Contains die proofs, postage, forgeries, first flight covers, postal stationery, postal and revenue rate fees, revenue and tobacco stamps, picture postcards; cornercards. "... no other comes close"
Newfoundland Specialized Stamp Album concept is to create an album in colour so that pages look more impressive prior to obtaining the stamps. A number of unique pages have been created that exclude the expensive material. Care was taken to present the correct colour of each stamp and the best image. Revenue stamps are depicted. 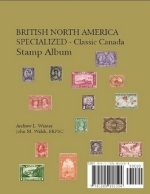 BNA Specialized Classic Canada Stamp Album has full colour postage stamp pages covering classic Canadian stamps from 1851 - 1951. Colour pages make your album impressive prior to obtaining your stamps. This comprehensive album includes Canada as a Province and as a Dominion. Airmail Stamps, Special Delivery, Postage Due, Officially Sealed and Registration stamps.